In a me-centered, selfie society, how do you raise compassionate, tender-hearted children? Teaching kids to care about others takes thought and effort. Knowing it wouldn’t just happen spontaneously, my husband and I came up with four strategies to help our three children develop a Jesus-type love for others. We recognize we need to set the example by treating them with kindness and respect. For instance: We don’t scold when they accidentally break something; we listen when they need us, and we take their concerns seriously. When we treat our kids with compassion, we soon see them treating others the same. We also show compassion to people outside our family. We pray out loud when we hear a siren. We respond to a crying or lost child. We hold doors for others and help carry heavy packages. We offer to help when we see a need – and we often recruit the kids! We recognize common bonds. We seek to make connections. As a mom with little ones, you know how encouraging it is to meet other moms with littles. Kids and adults respond best when there’s a heart connection. We can help our kids build that connection by identifying common bonds. One resource we love is Compassion International’s colorful children’s magazine Compassion Explorer. 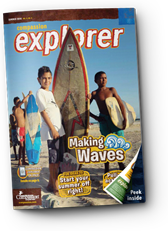 It’s a free downloadable magazine that introduces kids to children in other cultures. Our kids enjoy the stories, activities and perspectives of children around the world. We also use age-appropriate books and videos to teach our kids about issues such as hunger and poverty. When our children understand that kids around the world are just like them, they are more likely to want to help when they see a need. That’s compassion in action! We love and serve as a family. About five years ago, our family began sponsoring Leswin, a boy in Honduras, through Compassion International. It’s a wonderful way for a family to impact the life of a child living in poverty. This year, we took our two youngest children to meet Leswin and see Compassion’s work firsthand. Exposure to a developing country opened their eyes to the challenges families face, as well as their hopes and dreams. See a short video of our trip here. Last year, our oldest son, Brady, raised funds for his fourth mission trip to help those in need. What a joy it was to see the fruit of our efforts in this compassionate young man. MOPS and Compassion share common bonds. I love the common bonds MOPS shares with Compassion International; both to love and to act for moms and children. Compassion’s MOPS Family gives MOPS groups, moms and kids free resources: international recipes, games; and opportunity to learn about beliefs, issues and challenges families face globally. We can even choose a child to sponsor. When my daughter was 4, I asked her, “What does Compassion mean?” She said, “it means to love other people the way Jesus loves you.” I couldn’t have put it better myself! Laura Helwig is a child of God, wife to Shawn, mom of three, MOPS alumna and Child Advocate with Compassion International. Her passion is to help moms raise compassionate, world-changing kids to the glory of God, while helping to change the world for a handful of children they sponsor through Compassion International.